It took me quite a while to collect myself after watching the film “A Kid Like Jake”, based on the play by Daniele Pearle. The film has benefited a lot since the author has also penned the script. The film unfolds quite a complex issue about how two people try to face and later deal with the biggest problem that they met. And they try to do it gently, thoughtfully, even though their hearts bleed constantly. Let me be clear now. What should a parent do when they realize that their child – at a very young age – thinks he was born in a wrong body and that being a girl is what suits his personality the best? It’s tough and unimaginably painful, is it not? Still, life is always full of tough problems, otherwise, it will get boring and uneventful no matter whether we like it or not. 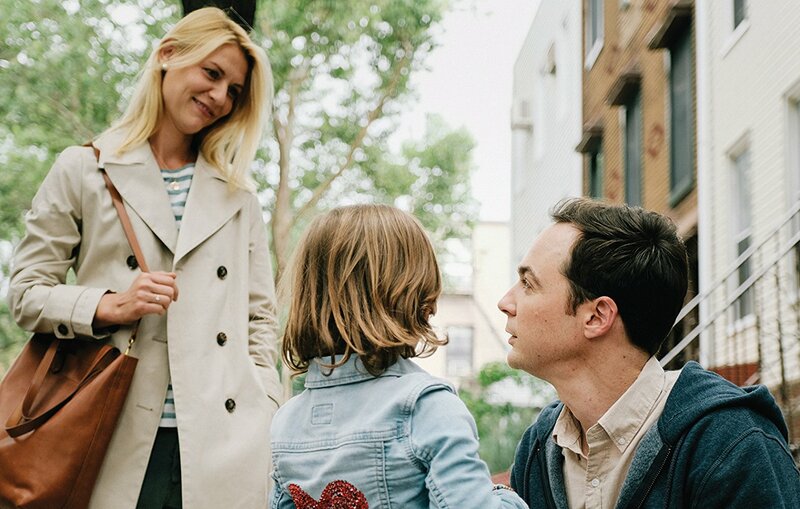 Alex (always great Claire Danes) and Greg (Jim Parsons) are happily married couple whose son Jake (Leo James Davis) is the shining star of their lives. Greg runs his own clinic, while Alex has given up her career as a lawyer to dedicate herself to being a mother. And quite frankly, both of them have done an amazing job raising Jake. Until the moment, when they are forced to navigate their roles as parents. Their young son prefers playing Cinderella to cars and G.I. Joe. Gradually, tension grows in the family, which escalates to the moment of major confrontation. They realize something must be changed, but what and how – they will still have to find out. Jake is acting out strangely. He is very defensive at school or at a party. Greg is a psychologist who helps his patient (Amy Landecker) to get to the core of her personal problem. Yet, he has his own problem to deal with at home. Alex, on the other hand, does her best as a parent. She first tried to move Jake to a new private school, where she hopes her son can get back to his normal self. However, the more she analyzes the situation, she gets closer to finding answers which are not that easy to find. Greg tried to be supportive and caring as possible. But the problem is, even his intelligent council cannot easily fix the situation he has at home. Right now, it is the future of his child at stake and they need to understand what is the best for him, and for them not to damage the harmony they cherish in their family. Directed by Silas Howard, “A Kid Like Jake” is carefully crafted story that reaches right to the core of the problem, delivering what it intends right from the beginning. Every single word, every single dialogue, and the scene has a story to tell. Subtly performed by Claire Danes and Jim Parsons, the film is like an express train that starts slowly to build-up its speed. It is a drama with a breathtaking directing, where Silas Howard has done a job of a captain with an impeccable eye. In conclusion, there is a lot to learn from “A Kid Like Jake”, especially for those who might face the same issue. It is a brilliant, super intelligent, deeply profound, and moving story that can be watched so many times. When it comes to Claire Danes’ performance, nothing could make me happier than witnessing her return on the big screen with such a delicately made drama. Her performance here is a new top level. I believe, whoever is familiar with her acting skills, is not going to be surprised at all. Last but not least, there is a great moral to this story that I will take away from it. It is always about two people when it comes to a marriage until a child arrives. When that happens, we need to ask ourselves whether it is our needs that come first or the child’s? Who should we help the family to overcome the crisis? There are so many kids like Jake around us. But do they have parents like Alex an Greg, who are the true gift from heaven? Not many are fortunate enough to receive such a gift.